888 poker, one of the leading online poker room, have launched a special edition of ‘The Super Whale’ offering a $500,000 guaranteed prize pool, one of the largest cash prizes in its history. The tournament will start on 29th March 2015! 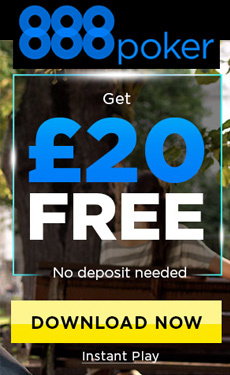 You can qualify for free thanks to our £12 no deposit bonus on 888poker! New 888 Poker players who register during the Super XL Series get 3 free tickets to daily Super XL Freerolls - no deposit needed! At each daily freeroll, the top players win a seat to one of the many Super XL main events, including a $1,000,000 Final Tournament. Enjoy $50,000 Freeroll Frenzy! It’s an exciting time for tournament poker with hundreds of freerolls, the chance to play in exclusive events and improved value in the VIP Scheme. There’s $50,000 on offer in cash and guaranteed tournament prize-pools which is sure to set your pulse racing. You can qualify for three $10,000 guaranteed tournaments through Heads-up Qualifiers, direct buy-ins or, best of all, 360 freerolls, meaning you could even book a spot at the table for free! During the month of February 2011, Redbet are giving players the chance to participate in our fantastic iCOP4 promotion, which encompasses 8 events over 8 days, and has a total Guaranteed value of €110,000 on Boss Media network!!! The World Poker Tour® is getting bigger and Partypoker got a fantastic opportunity for you to play a starring role in a brand new tournament.